It was promising to be one of those mornings where silver tufts of clouds peppered an azure sky. The leaves on the trees bristled in the gentle breeze. Dew drops clinging softly tot the blooming plush petals. Om prakash and Mohan had been delegated the work of draping satin curtains around the madap. Then the fabric would be pulled closer together and tied to the orante columns with crocheted lace ropes in the darkest shades of lilac. The rest of the hired workers were decorating the other spaces, but the mandap needed a hand from the family. Mamaji had decided Om Prakash and Mohan would do the honours. They hadn’t stepped away from work since sunrise. However, catching the opportune moment, unsupervised, they had pulled up the carved, pearly white, wrought iron chairs, meant for the banquet table. “Hum toh bahute hi pehle se janat the ki Arnav bhaiya aur Khushi didi will get married“. OP announced with a smug smile. Of course, he had not considered remotely the possibility of being challenged. Mohan sharply cut him off. “Hum hi toh sabse pehle janat rahe“. OP found himself getting irritated. Ignoring Mohan’s obnoxious claim he launched right into his story. “I have know all along. Diwali ka samay tha and Khushi didi ko dhanteras ka gifat chahiye tha. Humahi toh oo detergent packet Arnav bhaiya ko chupke chupke jaan pe khelke lake diyat rahe. He had given instructions koi dekh na le. Naniji, mamiji..from everyone’s eyes I only hid the packet. Aur baad mein samajh aaya.. He put 2 silver coins in it, for Khushi didi“. He was complacent with the effect the story must have had. He waited for his friend to show wide eyed wonder, but the reaction was not as expected. Mohan clearly thought he was winning. “You?”, OP asked disbelieving the atrocious assertion. “Haa..hum naahi to ka tum?“. Mohan settled down, his hands supporting his head, while his legs stretched out in front of him. He stared out into the sky, satisfying himself of the pregnant pause before he started. “Aree it must have been her first week in AR.. Khushi bhabhi was made to stand in the rain by Arnav bhaiya…Alone in that parking lot. DO you know unhe aati gari se kis hero ne bachaya? Humare Arnav bhaiya“. Mohan was apparently the better story teller of the two, because OP had pulled his chair closer. He did make sure the carmine velvet seat covers did not get wrinkled. He urged his friend on. “After that when we were going home raate bhar Khushi bhabhi kept saying all sorts of things about Arnav bhaiya. Same jaisan filmo mein howat hai. Hum toh tab hi se keh rahe hai ki pyar toh hona hi tha“. Mohan ended his story with a florish. OP was not giving up. “I know more about her. Humare sath oo luka chupi khelat hai. So many times I have protected Khushi didi from his anger. Arree ekahi baar toh humne didi ko Arnav bhaiya ke room mein bhi band kar diya tha. Lock ghumai ke“. “ha you keep calling her didi. Humlog ki toh wo bhabhi ban gayi hai“, Mohan instigated. OP and Mohan scurried up from their chairs. Each picked an edge of the sheer fuschsia drapes that seemed to be sprinkled with the palest of star dust. “Hello hi bye bye Anjali bitiya bher eej?“, Manorama shashayed upto her husband. Conveniently forgetting her surprise from a few weeks back Manorama eyed her husband amicably. “Aap toh shutupiya hi kar liyo. Humka toh kabse lagat hai ki phatee saree making housejwa Arnav bitwa ke clojet ma“. At her own clever joke Manorama decided to laugh loudly. “Humari phool jaisan titiliya ko god mein uthai lai rahe. That time itself I had known that oo Raijaddan will be with out sanka devi. Dono hi thore mann mauji rahat hai nand kissore“. Buaji had poured herself a large glass of water from the crystal decanter. She had huffed and puffed her way into Anjali’s room, where the Gupta’s were going to get ready. Really these raijadans had too many stairs! It must take athe whole day to get from one portion of the house to the other.. Her eyes caught the rows of glass bangles on Anjali’s dressing table. Buaji eyed the, with longing. If only her wrist was slightly smaller she would have borrowed a few for the wedding. Buaji twisted Garima’s ear, “dulham ki amma majak urawat hai nand kisore“. “di..di naniji ko aapse kaan hain“, NK had barged in expecting Anjali inside. “hain.. Kaan hainn?“, buaji exclaimed still holding on to Garima’s ear. Garima tried to pacify her over excited sister-in-law. Her gestures went completed unnoticed by the lady. “babua kaan nahi .. kaam hai“, she corrected, extricating herself out of buaji’s grasp. “Same difference..that’s it“, NK grinned at Khushi’s amma. “Arre come inside babua. We are talking about Arnav bitwa and Khoosi bitiyas jodi“. Buaji was smiling fondly at him. “nai.. Mujhe kaan.. I mean kaam hai“, NK panicked, like he always did in front of the over friendly old lady. “hai re nand kisore bahutehi sharmat ho babua. Come here and sit. Tumako shaadi waadi karni hai ki naahi“. NK decided it was time to drop the niceties, and bolted out of there, fearing for his bachelor life. The poolside was a riot of colors too. Flowers in full bloom made the place beautiful. The ripples in the clear water that refracted to the sunlight cast faint patterns on the far end wall. The moved and flickered, and in the blink of an eye took other surreal shapes. Nature had made sure the place held magic. The brooding gardener was bringing home his coveted sunflower. “You can talk to me every morning Khushi“, he was leaning against the entrance to the poolside, watching her. 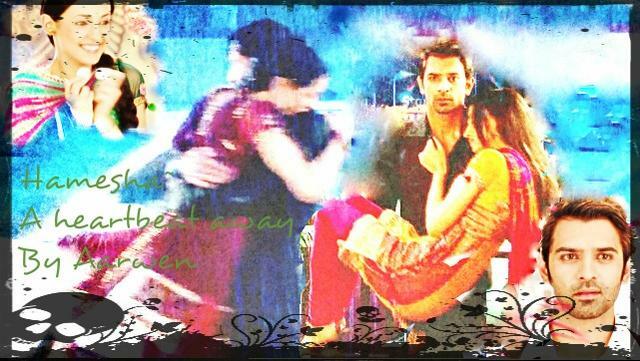 Arnavji was in that dark vest of the coarse fabric that Khushi wanted to run her hands over. “And you can go back to buaji’s house whenever you want to“, his voice had grown serious. “laad governor.. Abhi se humein apne se dur bhejne ki baatein kar re hai“, she muttered darkly. “I don’t want to go anywhere away from you. I will always be with you Arnavji, samjhe aap?“, she glared at him. “Hamesha“, she scampered up and held his hand for a second before letting it go with a jerk. “Haw!”, her hand clamped on her delectable mouth. “aaj humari shadi hai Arnavji“, her hands flew in the air widely. “hmm.. I know that darling..“, his eyes sparkled with a devilish gleam as he murmured. “In case you forgot I have been looking forward to tonight“. She shivered, and it had nothing whatsoever to do with the temperature outside. “paar.. Di had said larka larki can’t meet before the wedding.. You shouldn’t be here“, she admonished. Almost ready to drag him out of his own room. “Achcha.. Aur kaun rokega mujhe?“, his eyes arched high in lazy defiance. She felt a little faint. It might be because she needed some food. It was equally possibly that he was too close. She was surely getting lost in the shiny darkness of those eyes, and forgetting to breathe. He was playing with his ma’s kangan, that never left her daughter-in-law’s hand. His eyes held a fervent emotion, blazing with as much vitality as the sun. She smiled back content. Her eyes held a timeless promise, tranquil as the moonlight. “Maa.. Maaa” Lakshmiji had gotten herself entangled in the flower garlands left near the poolside. Laughing Khushi went to help unravel Lakshmiji. 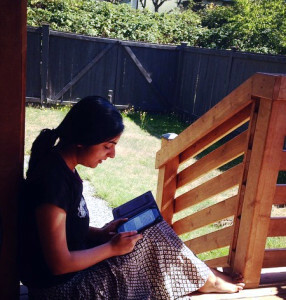 She missed the tender expression on Arnavji’s face as he sat down on the poolside recliner. His eyes glistened with memories of the girl in fairy lights. They had blinked right at him and held him hypnotized. She had quivered at his touch, her eyes tumultous. She had come near the chair as she was speaking. Smooth and swift he pulled her on his lap. Her heartbeat thundered in her ears..dhak dhak dhak..
“If you are bored there is a lot the bride and groom can do today“. He tilted her chin staring right into her eyes. Then tantalizingly slow he brushed his lips against hers. She closed her eyes and sucked in her breath. Her hand had skimmed against her back. Intimate and knowledgeable in its touch. “di..”, she yelled. He did not exactly let go but was distracted enough to turn towards the room. She got up with a giggle, blushing madly..
“laad governor.. Devi maiyya..” and dashed away. Not before turning to take one look at the man she loved. Madly. Wildly. With the intensity of the oceans, certainty of the lands and boundless like the skies above. Like a never ending prayer, like an everlasting dream. Like the hamesha of heartbeats. “Manorama, my old eyes had spotted Khushi bitiya in that first meeting. Lukhnow se aur itni meethi boli“. Deviyani Raizada kept arranging items on the silver puja thal as she conitnued talking to her daughter-in-law. Chandan, akshat, kumkum. She mentally ticked off each item. Anjali bitiya would know where the kapoor was kept. With a wail Manorma lowered her head onto her mother-in-law’s lap. “humare bitiya je sang ee ka hui gava sasuma? How comej we nat isseeing damaadji ka karat rahein behind backwas“. Deviyani Raizada felt a terrible sadness steal over her. She patiently patted her daighter-in-law. She meant well, after all. “Sab theek ho jayega Manorama. We will all be there for our bitiya“. Deviyani shook her head indulgent of her for once. “Mamiji..naniji.. Have you seen di?“, Khushi had come inside. Her face was flushed and vibrant. What a pretty bride she would make, the old lady thought with deep affection. NK was following a still angry Akash towards ASR’s poolside. Akash had gotten his sneakers back, but the exchange had also involved a lot of money. “NK bhai in case you forgot you just stole my shoe“, Akash scowled at his cousin you was waving a thick bundle of crisp new notes with a flourish. Akash blinked a couple of times trying to process how stupid he had been. “ye pyar ka kamaal hai. Larke bilkul hairan preshan hai“. Nk was least bothered and busy counting the money. “Arnavji we can’t find di anywhere“. Khushi had rushed in with Payal close behind. Hardly waiting for the reply he sprinted towards di’s room. Within minutes the entire household was scoring the numerous rooms, interwoven passages and poolsides to search for Anjali. “Anjali eej not picking up pphone.. Missed callwa hui ja raha“. Mami informed in a loud voice not sure where everyone was. More groans came as Akash was dispatched to check outside. The happy wedding household had turned to a fearful group of people within seconds. “I’ll call the police“, ASR said, his voice tensed. His brain was busy going over the possible places Anjali could have gone to. Shyam.. He knew this could only be Shyam. Khushi supporting the sobbing shaking nani distracted ASR. He leapt to hold her and seat her down. Garima had a glass of water ready for the shaken lady. “nani I promise you main di ko le aaunga. I’ll find her“. ASR was in hell. Where had di disappeared to? “bhai the guard outside saw di get into a car with Shyam“. Akash came panting inside with the news. “hai re nand kisore.. Oo Shyam humlogan ka peecha hi nahi chorat hai“.. Buaji was as stricken as naniji. “Dammit“, ASR spat the words out. “I won’t let him get away for this. I had warned him to stay away“. His teeth were gritted and eyes thundered with fury. “Anjali bitiya alone toh naahi hai.. Nothing eej happeningj to bitiya. Saasuma you nat to worryj pileej.” mamiji sounded a little relieved, not knowing that being with Shyam was infinitely more lethal to Anjali than being alone. Shashi Gupta, who had all this while been watching anxiously, had started to shake violently. Khushi rushed to his side. After another fierce struggle with his own muscles, his lips moved a little. Khushi bent her head to hear what babuji was trying to say. “Arnav..“, he stuttered. 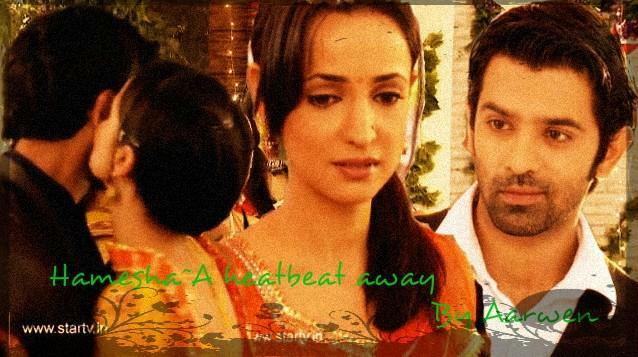 Khushi turned to look at ASR. Babuji had finally spoken. Amma had now broken down completely, but babuji was urgently gesturing towards Arnav. ASR dashed towards the man in the wheelchair and knelt down. “Shyam.. Dangerous..” babuji’s words were gaining strength as he spoke. His son-in-law’s intelligent, quick flash of understanding soothed the man. “Humari ee halat..Shyam“.. Babuji had barely spoken the words that ASR nodded curtly and stood up. “Akash call the doctor. Now“, he shouted and he made his way towards the front door. Khushi had given her babuji a hug before she ran after him. Payal was already holding babuji’s hand as Khushi reached ASR. He was near the Shantivan door. Full of a single purpose he stode out. ASR had dialed the police commissioner’s number. He would drive out and find di.. Somewhere.. somehow.. He would get to her. what a beautiful start to the day..Arnav-Khushi talk is sweet..wedding brings happiness.. wedding with happiness means double treat for Arnav and Raizada family..i don’t want to talk about anyone else here..